Released in 1983 10 to Midnight has become a cult favorite among Bronson fans and while I liked the film, but when compared to other Bronson films such as the Great Escape, Once Upon a Time in the West and even Death Wish, which despite its popularity doesn’t always get its rightful credit as people mostly seem to focus more on the action packed sequels, but this film isn’t quite as strong compared to those. 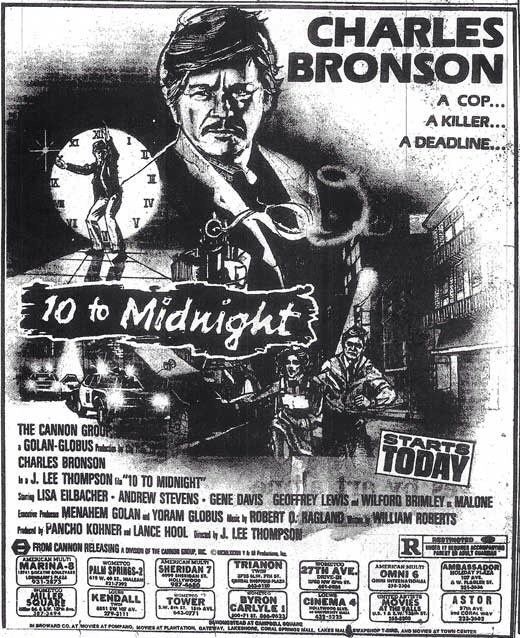 10 to Midnight has often been compared to Death Wish, but it seems every film Bronson made after Death Wish gets compared to it, but if anything 10 to Midnight is a lot closer to Dirty Harry as the 2nd half of the film, Bronson’s character begins to follow the villain waiting for him to do something much like how Harry followed the Scorpio killer. I suppose since Bronson takes the law into his own hands its linked to Death Wish, but truth is the films are quite different. 10 to Midnight was released when the slasher film was highly profitable and while it was at its most popular in the 1980-1981 range, these films still continued to dominate the market throughout the rest of the 80s and many filmmakers made films that takes aspects of the slasher film, but wanted to avoid the slasher conventions that started to bog down these films. Besides 10 to Midnight there was also the Chuck Norris film Silent Rage, which mixes crime/drama/action and throws in a little slasher as a couple of scenes seem clearly inspired by John Carpenter’s Halloween and the most famous film for adding in slasher conventions, but doesn’t fully go down that road is the Stepfather from 1987. More often than not these films can suffer a bit from lack of identity with the exception of the Stepfather. Silent Rage would have been better off going in one direction (the slasher aspect is the strongest) and one can say the same about 10 to Midnight however it works better than Silent Rage, but nowhere near as strong as the Stepfather. Leo Kessler (Bronson) is a cop hot on the trail of serial killer Warren Stacy (Davis). However with no evidence and an airtight alibi there’s nothing Kessler can do, but after another murder, Kessler plants evidence, but when the truth is revealed, Kessler is fired and Warren a free man. Kessler begins to follow Warren and even posts crime scene photos at his job. But it becomes even more personal when Warren begins to stalk Kessler’s daughter Laurie (Eilbacher) and its not long after that he plans to make her his next victim. The screenplay was written by William Roberts who also wrote the classic western the Magnificent Seven, which starred Bronson in an all star cast with the likes of Steve McQueen and Yul Brynner. 10 to Midnight would actually be the last film Roberts would write. As mentioned the script balances crime/drama and slasher, but Roberts avoids the pitfalls often found in the slasher films, but the script is bogged down by being the typical thriller and it perhaps takes a little too much from Dirty Harry. Characters are fairly decent and are interesting enough when the focus is on them rather than the action. The influence on the script seems to take aspects of serial killer Richard Speck and I have to assume the slaughter of the nurses were directly inspired by Speck. While the screenplay has decent characters and a strong idea, but I’m not sure Roberts was the right guy for the job as at times the script isn’t entirely sure what it wants to be and due to that it can lack an identity. However with that said 10 to Midnight isn’t poorly written as it is decent enough, but there was potential for more. The direction by J. Lee Thompson feels a little restrained in regards to he doesn’t wanna go down the slasher route or exploitation, but does incorporate aspects of both. Thompson seems to be aiming more for a sophisticated thriller, but the script wasn’t strong enough for that and I can’t help but feel the film would have better served going for more exploitation. Some have compared the death scenes to Psycho in how it was shot in regards that we don’t actually see the stabbings and while I wouldn’t be surprised if Psycho had an influence on Thompson and no offense, but 10 to Midnight shouldn’t even be mentioned in the same sentence as Psycho as this film isn’t in the same galaxy. Though to Thompson’s credit he does try to make more out of the film and playing up to the exploitation film would have been taking the easy way out, but maybe the better move. Even after Michael Winner turned the Death Wish films to all out exploitation with the 2nd and 3rd film, Thompson with the direction on Death Wish 4 very much moved away from that style. The pacing is generally strong until about the middle of the film when it becomes a little disjointed, which has more to do with the writing and 102-minute running time does seem longer than it needs to be. However Thompson still keeps the film above float and delivers a terrific final act with some genuine suspense and tension and the ending is a classic Bronson moment. 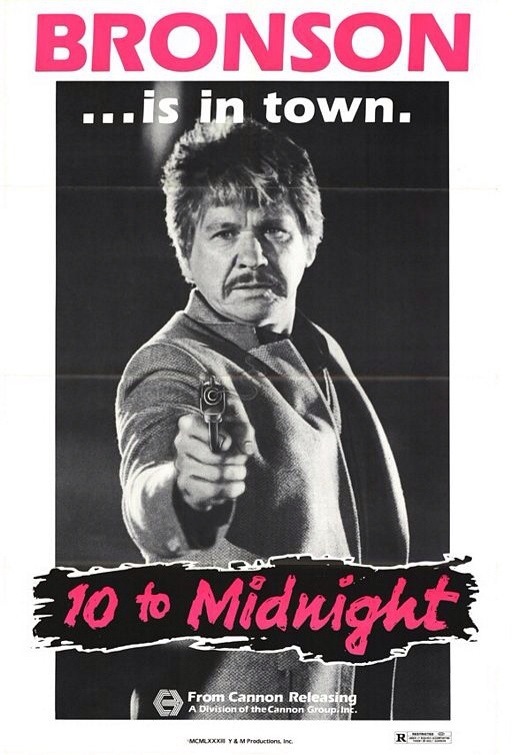 10 to Midnight was the 4th of 9 films Charles Bronson made with J. Lee Thompson and this film also marked Thompson’s first film with Cannon and the remainder of his films after this were made with Cannon with the only exception being the Evil That Men Do (which also starred Bronson). Two years prior to 10 to Midnight in 1981 J. Lee Thompson would direct the cult slasher film Happy Birthday to Me and even in that production, Thompson doesn’t seem to wanna take the film fully down that road and aims more for a thriller. While the cast is strong, obviously it’s Charles Bronson is why people seek this out. Charlie is his typical no nonsense tough guy and while his performance isn’t on par with Once Upon a Time in the West, Bronson still provides a fun performance, but he does seem to be going through the motions. While after Death Wish he played a lot of Paul Kersey type characters he played the break the rules cop a lot more as besides 10 to Midnight there was also Murphy’s Law and Kinjite. Overall 10 to Midnight is a solid film and while not one of Bronson’s best films it still has enough to offer and the ending alone makes it a worthy viewing. While the film is a little disjointed in spots its still effective in particular the final act. Also look for Kelly Preston as Doreen in an early role as one of the nurses killed by Warren and in the credits her name is listed as Kelly Palzis.